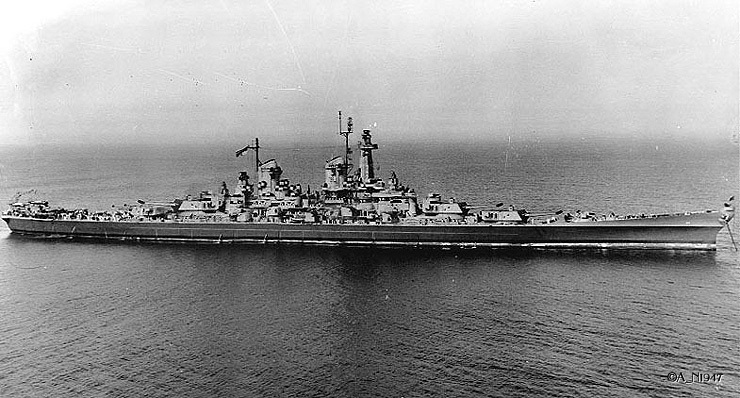 Those who are interested in World War II-era warships usually have at least a passing knowledge of Iowa-class battleships. These were the United States' response to the buildup of capital ships in the years leading up to the war, and are considered by many to be one of the finest designs ever to leave the ways. But unless you are an avid fan of this period or this type of ship, you might not be aware of an even larger US battleship designed to answer the threat presented by such superbattleships as the Japanese Yamato. Enter the Montana class. To the untrained eye, the design looks like an Iowa with a fourth 16" triple turret added at the stern. But in reality, these ships would have been significantly different in a number of critical areas: armament, armor, and gross displacement. "Would have been"? Although the design was approved for a five-ship class and two were actually ordered, the entire program was scrapped before any construction started. As a result, there is very little information about these would-be ships available today (the "photograph" above is nothing more than a clever artist's concept). A typical Internet search yields links to images of models which were built during the concept phase, and a few official documents: but the vast majority of information on the topic is not much more than entertaining speculation. As an aside, it seems to me that most accomplished modelers "hone in" on one type of subject: aircraft, ships, etc. and even on a single scale within that subject group (eg., "I model 1/48th scale aircraft" or "I build 1/700th scale ship models"). I, on the other hand, have never been able to stay focused on one such group, instead building whatever happens to catch my fancy. There have long been numerous sources available to the modeler for various styrene-based battleship kits, including Revell, Tamiya, Nichimo, and (more recently) Trumpeter. I think I read somewhere that Revell's Missouri kit was its best-selling product for DECADES. Tamiya has long been the "gold standard" with its 1/350 and 1/700 line of warships, and while the truly knowledgeable can point to numerous inaccuracies in each of these kits, they all can be built into very fine looking models. But no one makes a kit of Montana. I've long thought of building a Montana. I have seen other such models over the years, and each one has been inspiring. Most started life as a standard Iowa and were modified in various ways to capture at least the major attributes of the larger ship. I even purchased a Tamiya Missouri for the soul purpose of cutting it up to create my own Montana, but could never bring myself to start with the hatchet ("Nah, it's too pretty a kit: I'll just build it as Missouri..."). I recently completed Revell's 1/72nd Hermann Marwede, so I was in a ship-building mood. It was getting close to Christmas ('07) so I figured materials for a new project would make a great gift to myself. But again, no one makes a kit of Montana. Enter the world of aftermarket resin-based ship kits. As mentioned, I am not a "ship modeler" in the classical sense, and so when embarking on this project did not have a great deal of knowledge about this sector of the hobby. But when I started seriously Jonesing for a Montana, it didn't take long to realize that I had two basic choices: create a Montana by cobbling one or more Iowas together, or go resin aftermarket. Never having built an all-resin ship, I was skeptical about undertaking such a large project as a first one. In the end, however, I chose to go the resin route. Currently (07/08) there are two choices: IHP in 1/700th, and Yankee Modelworks in 1/350. I tend to prefer working in larger scales, so my choice was made. Currently (late 2007) the YMW website lists Montana (# YKM-35069) at $550. The description of the kit consists of "The Yankee Modelworks kit of the Montana represents the ship in her final configuration in 1943. The kit comes with all the parts needed to build the kit. The kit consists of Resin, White Metal, & 3 sheets of photo-etched parts. A complete set of instructions is included with the kit." There are no photos of the kit or its components on the website. After searching around for deals on the 'Net, I found the best price to be somewhat less. I spoke with my favorite shop owner who agreed to match the online price. I always try to support my local shop, and when something like this comes up it usually winds up being a win-win. The kit arrived in December '07. See the Contents menu at left for additional topics.